Now there is no need to head to the local fast food restaurant when you want to experience authentic french fries. Fry up french fries restaurant style, without going out. This deluxe french fry cutter can handle the job. The cutter features two stainless steel blades with 36 and 64 holes and an eight segment fruit wedger, along with a suction base for secure stabilization. 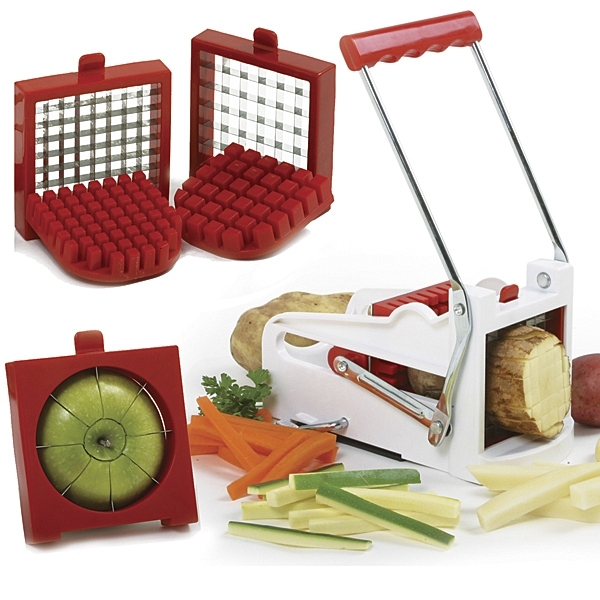 You will be able to easily and efficiently slice uniformly thick or thin french fries with one simple move. Additionally, you can use the unit as a fruit wedger to easily core and slice uniform sections of fruit. Hand washing recommended. BPA free.